Whether you have two sites with 20 employees or hundreds of sites with tens of thousands of employees - enabling self-service printer installation is critical to reducing help desk calls and increasing productivity. 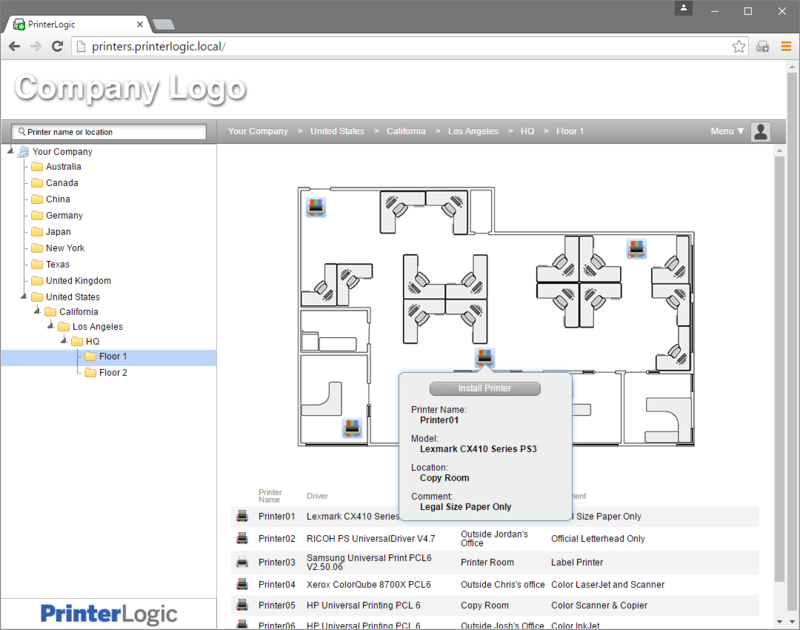 PrinterLogic’s Self-Service Installation Portal with Floor Plan Maps gives end users the power to install printers they have access to throughout the enterprise with a single click. For IT, help desk calls are expensive. Printer-related issues add up quickly and represent 10% - 15% of overall help desk traffic. The visual element of floor plan maps enables end-users to install printers on their own without interaction from the help desk. IT has the option of providing a URL, using the PrinterLogic client to create an easy link to the portal or embed the portal URL into your corporate intranet or knowledgebase application for easy access by employees. End users access the self-service portal to see a list of printers at their location. They use the uploaded floor plan map of the branch office to interact with a visual location of the printers near them. A simple click will install the printer, keeping employees happy and efficient.